④, T: Put a charge counter on the mayor’s scepter. T, Remove three accumulation counters from the mayor’s scepter: Following this turn you do an additional turn. It can be hard to assess cards like this. On the one hand, it’s a repeatable extra-turn effect, like a fixed version of Alpha’s Time Vault. On the other hand, it’s a fixed version of Alpha’s Time Vault, meaning that it only requires an aggregate fifteen mana to get your first extra turn. Not only might your opponent have won the game by then, it doesn’t do anything to disrupt your opponent on its own, relying on your having something meaningful to do on that extra turn. That pretty much rules it out for competitive play, although I really can’t rule out that there are situations somewhere else where it could be used. Commander metagames and some kinds of casual decks can generate enough mana fast enough to make it look a little less exorbitant, and it certainly interacts with any cards that manipulate counters – Inexorable Tide, anyone? Been a while since we’ve seen this card, hasn’t it? Magistrate’s Scepter is making its triumphant return to Standard (and its Modern debut) almost 20 years after its original (and only) printing in Mercadian Masques. As with any other artifact with a powerful effect, the question becomes how to abuse it; as it is, spending 15 mana over three turns and then tapping it on your fourth turn to take one more turn is a bit clunky and pointless. Part of what makes this interesting is that it uses charge counters, which we have seen in both Mirrodin blocks, and there is definitely a lot of interaction you can do with the card once you get going. Proliferate, for example, is a nice way to speed things up, and I hear Doubling Season also works well that way. It’s possible to see a scenario where, once you get enough counters on the Scepter, you take all of the turns after that, which is always fun. 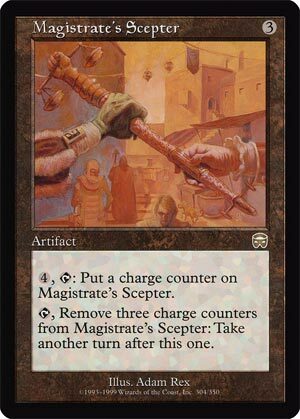 Magistrate’s Scepter is a tantalizing little meatball with a potential payoff in the right shell. I’m interested to see where it goes, now that it’s joining Modern’s card pool.